It is no exaggeration to say that I can spend all morning shopping here in Hanoi. Pause a moment while I wait for friends and family to process what I just said. Karen shopping? It will seem unlikely I know but …. I haven’t yet found a shop that sells everything that I want for a meal so I end up going from shop to shop buying meat here, vegetables there, condiments from a third and bread from – well, the bakery of course! Things aren’t so different here. Or at least that’s what happened before the fabulous Chi took over the running of our household. Now, at least some of the traipsing around can be alleviated by telling her in advance what I need and waiting for her to arrive for work, happy, smiling and bearing gifts! Well, fruit, veg and/or meat to be accurate but it feels like a gift because the quality and price are far superior to anything that I can manage to buy and I’ve had to make so little effort myself. 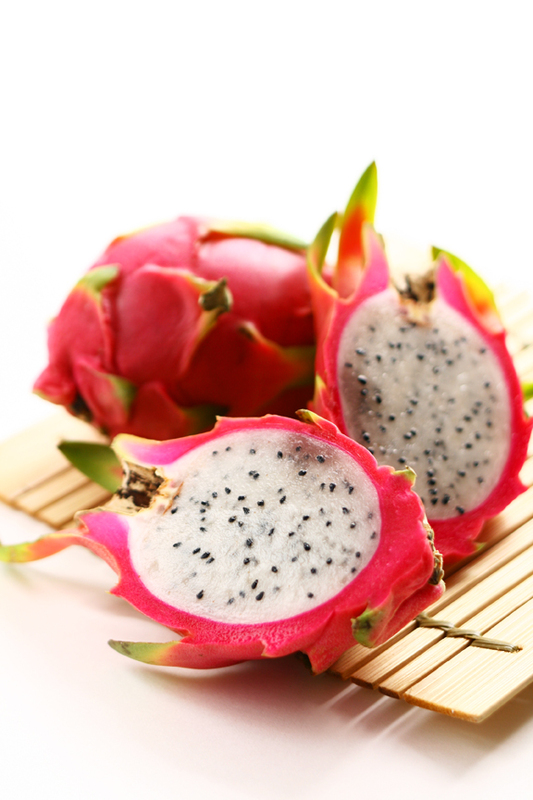 When I complimented her yesterday on the quality of the Dragon Fruit she’d bought me she replied, with a totally straight face: “I am a Vietnamese woman. I know how to shop”. Well quite a few of my friends know how to shop Chi but trust me, they couldn’t buy fruit at the absolute peak of perfection quite like you do! In the UK I would often trek around one of the big supermarkets, aisle after aisle searching for a product that eluded me only to ask an assistant who pointed to the very shelf where I was standing (who does decide where all those products go by the way?). Out here my inability to find items is greatly simplified by the clever Vietnamese grouping all their shops by item, especially in the Old Quarter. Therefore if you need paper you simply go to Paper Street, if you want bamboo furniture head over to Bamboo Corner. However, even this cunning strategy falls down, from my perspective, when it comes to two particular items: nappy sacks and tea towels. I absolutely can’t find them anywhere but I love the idea of Nappy Sack Street so am not going to give up. Without wishing to further worry my family with talk of all things baby related I was thrilled to find, after only an hour’s searching, Paddling Pool Lane. The dog (nappy sacks are the perfect receptacle for taking out on dog walks) is in danger of over-heating out here and absolutely refuses to go near water unless it’s a muddy puddle or Westlake where the only steps in and out are about a kilometre from the house and it’s too hot to walk there. Hence the need for a paddling pool! Tea towels? I’ve no doubt I’ll find them when I least expect to and no longer want them. Until then, I’ll make do with the one that I packed (accidentally I admit!) and await my furniture shipment from the UK. I’m conscious that it would be very easy when writing about a place where I am very much the alien, to sound like every comment I make is a judgement call. Let me clarify right at the start – the comments I make are observations and absolutely not judgements. Of course, I come from a particular generation, gender, culture etc. etc. and those give me a set of rules by which to live. If I am going to write anything about my time here I simply don’t have the time or energy to qualify every single statement and question whether I’m sounding too negative. If I intend something to be overtly negative or critical, I will make this absolutely clear at the time of writing – otherwise please do not take offence at anything I am saying. My way of doing or seeing things is no better nor worse than yours or indeed the situations I’m observing. They are worthy of comment simpy by virtue of being different to what I know/expect or because of my reaction to them or whatever – they resonate for me in some way and I’d like to share them with you. Having been brought up as an expat child, moving to Kuwait when I was 8 years old (back in the late 1960s) I was perfectly comfortable with having domestic staff around – an aya (housekeeper/maid/nanny) and a gardener and various other people who seemed to work hard and always be smiling. It’s not a natural state in most British households however so I do have a slight aversion to paying someone to clear up after me. However, it is pretty much de rigeur here among expats and many Vietnamese so I jumped at the offer from a friend to “share her maid”. I set off to meet said ‘maid’ (whose real name is Phuc but my friend has young children and they agreed it would be better to change her name to Chi) thinking that I was about to conduct an interview. Oh no, not a bit of it. A gruelling 20 minutes later when I had agreed to: paid public holidays, paid sick leave, overtime, a one month bonus at Tet (New Year), pay while I’m on holiday, an annual pay rise and a one month bonus for each year worked when I leave (all perfectly reasonable requests I thought) I found myself leaving with a housekeeper/cook who has agreed to take me on!!!!! I need to spend some time thinking through this interview because there are some serious negotiating/selling skills lessons to be learnt! Anyway, I’m delighted and Chi starts on Monday morning. Most of the grocery shops that attract the expats have notice boards and they are often teeming with Situation Wanted adverts – predominantly for cooks. It is patently clear, with even the most cursory glance at these advertisements that the pinnacle of achievement for a domestic cook is: ‘Can follow Jamie’. Jamie Oliver, if this message ever finds its way to you my advice is to get yourself over to Hanoi pronto. Okay, Gordon Ramsay might have beaten you to it in television terms but I tell you what Jamie, you have the most loyal following out here – the mere mention of your name literally opens the door to peoples homes. I have applauded the school meal and other initiatives and would love you to know that just by being, by producing your cookery books and I guess by making the TV programmes you are enabling people to work who might otherwise struggle. How fantastic is that!!! Staying on a house type theme, we move into our new house this Sunday and I am sooooo excited. We will move from a small apartment crammed with furniture to a huge house and barely any furniture. Because land is so limited here in Hanoi the houses tend to be narrow, deep and tall and every inch is used. We struggled to find anything that was built on a human scale – some of the rooms were just so big that even moving from a 4/5 bedroom house in the UK we would fit all our furniture in one room here. Having been married for 7 years I learnt something new about my hubby during the househunting. Well, I learnt two things – he hates househunting and, more interestingly, he loves modern houses. I had no idea. This came to light when an agent managed to sneak in a viewing to a house that was totally unsuitable but he wanted us to see it – the most enormous, brand new, 7 storey extravaganza I’ve ever seen. I hated it and Kevin loved everything that was new about it. This made me re-think my viewing policy and I realised that earlier that week I had in fact seen a house that he might just love, but that I had discounted without a second glance. I hastily phoned another agent and requested a second viewing and lo and behold – he absolutely loved it. Here was our dream home (apparently!). To any friends or family reading this – contrary to popular belief I obviously do not wear the trousers in our house because this house was most definitely not my choice. However, it wasn’t complete and we’ve had to wait 4 weeks before it will be ready for us. During this time I’ve walked around the area and watched the house progress and I must confess I’m really taken with it. It’s not a house I would ever buy or could even afford in the UK – 5 floors, a lift, a pool in the basement, a roof terrace to die for and the most enormous sun lounge and balcony. Now that I have Chi to keep it all looking pristine I can just relax and enjoy living in a space that’s completely different to anything I’ve experienced. I love home-making and am really looking forward to turning a relatively blank canvas into a welcoming sanctuary and haven from the madness that is Hanoi. 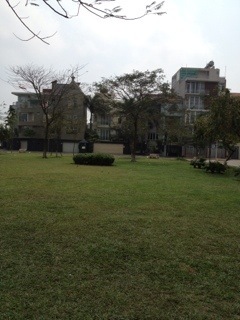 See photo below of the green just beside the new house. Just before I leave the subject of house hunting I was surprised by the ‘customer is king’ attitude of landlords here as in house after house I was told: we can remodel it for you. If you don’t like that wall there, we’ll move it, want a wall here? No problem, we’ll put one in. New kitchen? But of course. New bathrooms? No sweat. Anything you want, we can do it. All I can say is that the experience is nothing like we encountered as landlord’s when renting our home in the UK. Everything was pretty standard and the agent advised us before marketing the property what we should and shouldn’t do and what was expected by most tenants. Also of course, the rent we could expect. Here in Hanoi the rent bares absolutely no relation to the size/style/quality of the house and Kirsty and Phil have no chance here – location is almost irrelevant too in setting the rental price. It is entirely dependent on the landlord/owner. They will charge whatever they want for their property – you pay it or the house sits empty. The Vietnamese are very superstitious and will not carry out important transactions on an inauspicious day. April 15th is a good day to move house – thankfully!